This web site participates in 「全国中学高校Webコンテスト」. 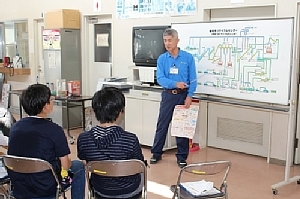 We visited Hakodate Waste Treatment Center. ・This is the facility to recycle the garbage (aluminum cans, steel cans, glass bottles, and PET bottles) in Hakodate. 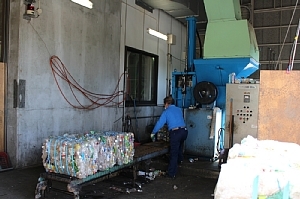 ・Here, in this facility, intermediate treatment of recyclable garbage is conducted: sorting, pressing, spallation, packing, etc. Some collected bicycles and furniture are repaired and sold in this waste treatment center. The total amount of recyclable garbage hardly changes each year, though it depends on the kinds of recyclable garbage. ※　Just as an aside, the amount of the collected steel cans fell off suddenly last year in the graph, but can you guess why? Actually, it is because fewer and fewer people buy canned coffee at convenience stores as the service in which fresh coffee in cups is getting popular. 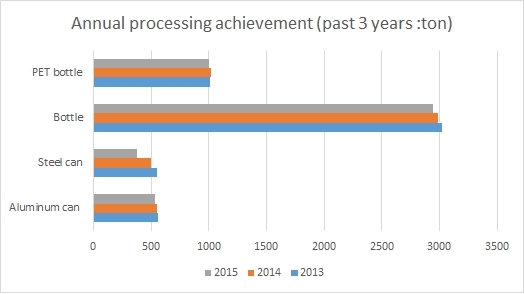 It is surprising that sales competition has an effect on the field of garbage recycling. ・Below are three kinds of recycling of PET bottles. (1) Material recycling ... To be used as they are. (2) Chemical recycling ... To be used after returning to resources. (3) Thermal recycling ... To be burnt into thermal energy. 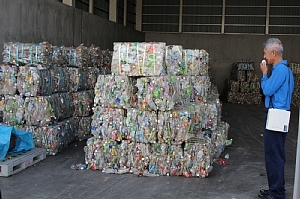 In this facility, PET bottles are recycled in the way of (1) and (2), and shipped. By the way, 600 PET bottles are recycled into one lump for shipping. Reduction of recyclable PET bottles has been encouraged, but the total amount of collected PET bottles remains because of the variety of PET bottles these days. At home, I usually separate recyclable garbage into plastic, PET bottles and cans, but I had no idea how garbage disposal would be conducted before I visited Waste Treatment Center. I've learned a lot about garbage recycling. I wish we could have seen the detailed process of recycling there. Unfortunately, it's not open to public to prevent accidents. We are encouraged to separate garbage in our school, but I'm sorry I'm not so conscious of separation, to be honest. I've learned the importance of recycling of used materials. Now, why don't you try to answer the quizzes to check your comprehension? Base template by WEB MAGIC. Copyright © 2016 [ Plastics in our daily lives ] all rights reserved.